Charlotte Amalie beckons you to stroll along her cobble stone alleyways, climb her streets of steps, admire antique West Indian furnishings in historic homes and explore 17th century Danish fortifications. 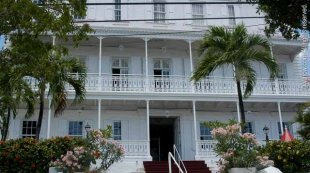 Founded in 1681 by Danish settlers, it contains a wealth of buildings that provide a glimpse into colonial life. It is listed in the National Registry of Historic Places as an area of particular historic interest. Often referred to as Downtown or just Town, Charlotte Amalie today is a bustling center for government, schools, offices, shopping and residences! Visit old and new Charlotte Amalie; see the evolution from a colonial trading post to one of the busiest duty free ports in the Caribbean! Here is a selection of sites you might visit. Charlotte Amalie is divided into three quarters: Kongens (King’s) Quarter, Dronningens (Queen’s) Quarter and Kronprindsens (Crown Prince’s) Quarter. They share similarities like the use of step-streets, but each has a unique character. All three quarters contain historically significant buildings. Some of the best preserved and most accessible are located in a small area of Kongens Quarter, and in the commercial area along Main Street in Dronningens Quarter. Looking for a really unique adventure? Then you will love our Night Kayak Adventure with Pirate and Ghost Stories. From Blackbeard, Bluebeard, and Teach, prepare for an experience with a dash of history, a pinch of the macabre, and a spooky twist when you kayak along the dark and winding waterways of the Mangrove Lagoon. Enjoy the starlit sky as you look for stingrays, tarpon, and other marine life illuminated with lights below your kayak. You will go back in time and relive those days when pirates, ghosts, and jumbies still roamed the islands. Hear tales of shipwrecks and the eerie legends that haunt the islands to this day. Virgin Islands EcoTours offers guided Kayak Hike & Snorkel Adventures at three locations: St. Thomas Mangrove Lagoon; St. John Honeymoon Beach; and Historic Hassel Island. Book online right now using promo code: VINOW, for your 10% discount!